better jobs to replace those dreary assembly line ones? Border Protection Minister "No wimp" Scott Morrison has shifted his ground on the violence at Manus Island under pressure. In doing so he has started to undermine the Abbott Government's attempts at operational secrecy and keeping citizens in the dark to ensure the authority of the state remains unchallenged. This is done by linking national security to asylum seekers (ie., terrorism), and the government being in control. The assumptions are those of undivided authority, ministerial policy management, and parliament reduced to partisan political "debate" (point scoring). 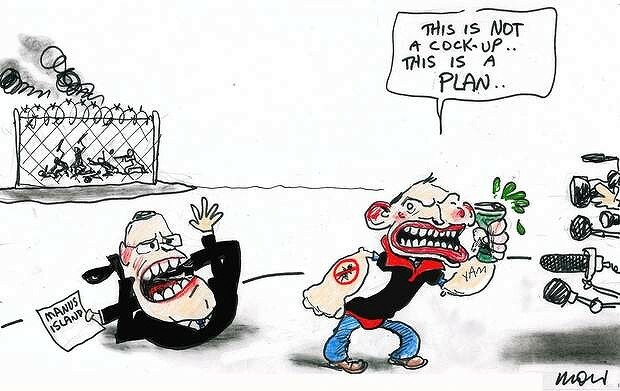 Morrison's initial position with respect to the brawl at the immigration detention facility laid the blame for the violence at the detention centre on rampaging/rioting asylum seekers for pushing through the perimeter fence. He stated that the death of the Iranian man at Manus Island had occurred outside the camp's razor-wire fence. The man had escaped and this had contributed to his death. It was a simple law and order issue in that there was a sudden eruption of violence by detainees. Order was quickly restored. The minister added that the PNG police did not enter the centre and their activities related only to dealing with transferees who breached the external perimeter fence. Over the week Morrison, who sees himself as the tough cop on the beat, has slowly reversed his position under pressure from eye witness accounts. The deceased man had died in the offshore gulag and had not escaped at all. He then conceded that the rioting and “response” by the PNG police occurred within the centre. What he didn't say was that G4S managers had lost control of the local riot squad. So why did the minister so quickly impute negative motives and apportion fault to asylum seekers in the immediate aftermath of last week's alleged riots? Presumably, to show that in being tough he was in control of things, and to reassure the conservative base that the state's authority continues to ensure security and order? Even though the Coalition is vulnerable over its boats policy Labor went easy on Morrison in Question Time. There were no searching questions about the role of G4S, the private contractors running the Manus Island facility, or that of the PNG police. No questions about Australia's responsibility when Morrison claims that the concentration camp is run by the unstable Papua New Guinean state; nor the proposal to send a small group of asylum seekers to Cambodia. Is this because the ALP had set up this hell on earth? It is now pretty clear that there was little law and order at Manus Island--Rudd's "hell on earth"--- and that G4S security system had lied about the events that took place. G4S had lost control. But who cares? The conservative base doesn't. As far as they are concerned the Abbott Govt, in "stopping the boats" from landing on Australia's territory, and its refusal to allow refugees to settle in Australia, is doing a great job defending Australia's sovereignty and its borders. The base doesn't care that Manus residents, G4S employees and PNG police stormed the facility, attacking the asylum seekers. The latter basically deserved what they got. Morrison has been forced to set up an inquiry into the events on Manus Island. Will the 'No Wimp' Minister's false account of events be included in the scope of the inquiry? What the Abbott Government fears is encroachment on the central state's authority and sovereignty from an external source, since it is this authority that is the basis of social cohesion within the nation state. So we can expect that the Abbot Govt's response to this review of this violence event and its management will be used to strengthen the ruthless logic of detention and incarceration. After all, Manus Island--Rudd's "hell on earth"--- is primarily a deterrence system rather than a facility to process asylum seeker claims. "So why did did the minister so quickly impute negative motives and apportion fault to asylum seekers in the immediate aftermath of last week's alleged riots? To show that in being tough he was in control?" The unrest in detention centres and episodes of sabotage on asylum seeker boats have been used by politicians as evidence of the dangerousness and unworthiness of the asylum seekers themselves.They are bad people and so deserve their punishment. indefinite detention in poorly regulated facilities that ensure a bare life for those incarcerated is likely to produce misery, chaos and violence. As far as they are concerned the Abbott Govt, in "stopping the boats" from landing on Australia's territory, and its refusal to allow refugees to settle in Australia, is doing its job in defending Australia's sovereignty and borders. the Coalition has turned back asylum boat number seven. It increasingly appears that G4S guards on Manus Island allowed locals into the detention centre on the night of the brawl where they began attacking asylum seekers inside the compound after the after the asylum seekers began swearing at people outside the compound. The local G4S guards asked the locals to enter the compound because they wanted “manpower to help them attack the detainees. Immigration Minister Scott Morrison has previously blamed every crisis and disaster in his trouble-prone immigration portfolio on Labor’s incompetence. He cannot do so now. He's now the boss of the regional gulag centres. The violence on Manus Island - the Sunday riot and the Monday attack on the detention centre that left one man dead and 77 injured - is now Morrison's responsibility. Manus Island is more an detention camp that is designed to be a deterrent to others than a processing facility to process the claims of asylum seekers. It would appear that the asylum seekers were being told by G4S staff that their claims were being processed, and that they would be settled in PNG. Yet though there was no decision from the PNG government on resettlement. So the asylum seekers were to be incarcerated indefinitely. Odds on Minister Morrison dumps on G4S. he has already terminated their contract. So they can wear the blame for the violence. Labor sees some good polls and decided to play it safe. Much assumption has been made of the events leading up to the gunshot. Perhaps Labor know what happened and are choosing the path that makes them look better or are simply waiting to see what the actual investigation turns up (not the media investigation)but there is more pressing matters. The vegie market roof is leaking and the road to the airport is bumpy OMG someone call the vegie police!! 'No Wimp' in "Border Protection Minister "No wimp" Scott Morrison " means a strict father type of leader. The tough guy is a winning image on border protection and national security because it responds to people's insecurities (fears and anxieties) about living in a globalised world. Thanks for a sane, sober and plausible summary..deeply appreciated. If only people would wake up to the dangers and implications of this recent set of events. It's not just stopping asylum seekers to see if they are genuine, it's the exploitation of the issue to increase authoritarianism in our own society, which in turns sets up a mechanism for a sort of continued erosion of freedom for asylum seekers and Australians alike.